Harry Potter’s gifted and brave friend Hermione Granger gets her own Christmas ornament for a most wonderful holiday season. Fans of all ages will love this stylized design. Coordinating Harry and Ron ornaments sold separately. Hallmark Christmas Ornaments celebrate characters from contemporary and classic movies, TV shows, toys and entertainment. Made of polyresin, this Hallmark Ornament measures 2.6 x 2.6 x 1.8 inches and comes in a 3.5 x 4.7 x 2.5 gift box. The ornament is ready to hang on your Christmas tree with a ribbon hanger. Perfect gift for fans and collectors of the “Harry Potter” books and movies, Harry’s best friend Hermione Granger, Hogwarts School of Witchcraft and Wizardry, and House Gryffindor. Each piece includes one Harry Potter Hermione Granger Christmas Ornament in a gift-ready box. Hallmark Christmas Ornaments are a great way to commemorate individual interests and those that you share with family and friends. Hallmark has been your family-owned creator of greeting cards, gifts, gift wrap and more for over 100 years. We take deep pride in helping individuals connect in just the right way. This Hallmark Christmas Ornament is lead-free. 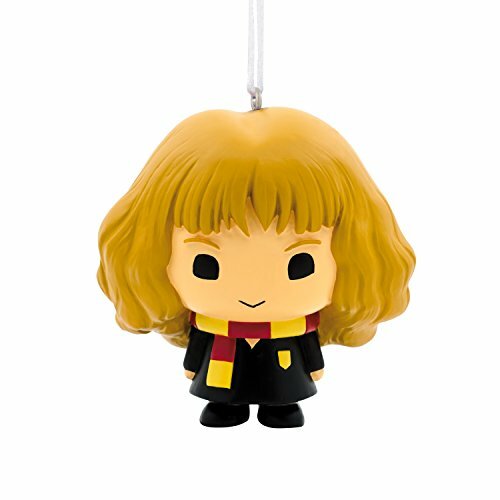 Decorate for a most wonderful holiday season with this Christmas ornament of Harry Potter’s gifted and brave friend Hermione Granger. Fans will love this stylized design of the brightest witch of her age wearing her Gryffindor scarf and coat. Made of resin, this Hallmark ornament measures 2.6 x 2.57 x 1.78 inches. The ornament is ready to hang on your Christmas tree with a hanger attachment. Perfect gift for fans and collectors of the Harry Potter books and movies, Hogwarts School of Witchcraft and Wizardry, and House Gryffindor.